This past Friday night, at the Halekulani Hotel, we prepared a dinner for the rehab hospital of the pacific. 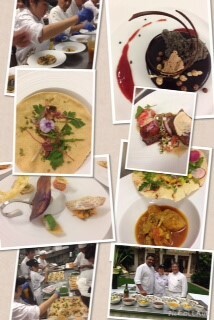 Our chefs, Miya, Kelly, Camille, Nick and I worked with the hotel staff and Executive Chef Vikram Garg. The dinner was a collaboration between Vikram and I. This is something I truly enjoy doing, he is great cook, great chef, and an even more wonderful human being. I learn something new each time we get together. It was a benefit dinner for such a tremendous cause, and I know we all benefitted from learning something new.